We mark the fall season around here with the changing of pillows, bed coverings and curtains, exchanging warmer clothes for those light summer dresses that still flutter from hangers. I stand stunned in the face of the calendar’s insistence that today is November 15th, so I look into the backyard, and this seems about right because the horse chestnut tree, which is actually a towering grove when you look to the base and see all the thin reaching trunks, is covered with its distinctive golden leaves. They are the clothing of November. Well, the grove of trees is not exactly clothed, as a good portion of the leaves — perhaps a third — have already fallen to our yard, and sit in huge piles of various stages of decomposition. This grove’s got quite a life. First is the bare season of the calendar year’s beginning when the tree(s) tower high into the Portland sky, reaching from behind our fence to five other yards. And then the spring blossoming, which we endearingly refer to as “poop flower season” when the unmistakable scent lingers heavy in the air and falls in sticky remnants under foot. Then there’s the leafing that creates the shady bliss of summer — our “happy season” of comfortable backyard fun and meals outside. How we love this tree then. And then in early fall comes the raining down of horse chestnuts in their medieval spike pods. Yes, there’s a reason we call it “hard hat season” because it’s the time when kids are best off wearing head protection before they play on the swing set beneath the giants. Lest you think we turn these massive piles of nuts into something worth keeping, well, we tried that. Before we knew it was a horse chestnut tree, Michael baked a tray of them in the oven, hoping they could be transformed into a delightful holiday gift, perhaps roasted chestnuts or a savory soup mix. The girls’ dreams had already turned to a sidewalk stand with overflowing merchandise: “Chestnuts – $1 a bag.” This was going to be epic. This tree is a slice of life here in this old house, probably deserving more than five minutes on a Friday morning because the metaphors feel endless. This huge, imperfect, snarly-branched mess we’ve inherited is reminder of constant covering, of change and the coming around agains. It grounds us. It is part of the stories we tell connected to the lives lived under its branches, these memories like roots going down deep, golden leaves fluttering to our feet. Joining today with the loving and encouraging Five Minute Friday community at Lisa-Jo’s. Today’s prompt: TREE. Just getting started and way past five. Thanks for grace, friends. Thanks, Julia. Happy to see you here. 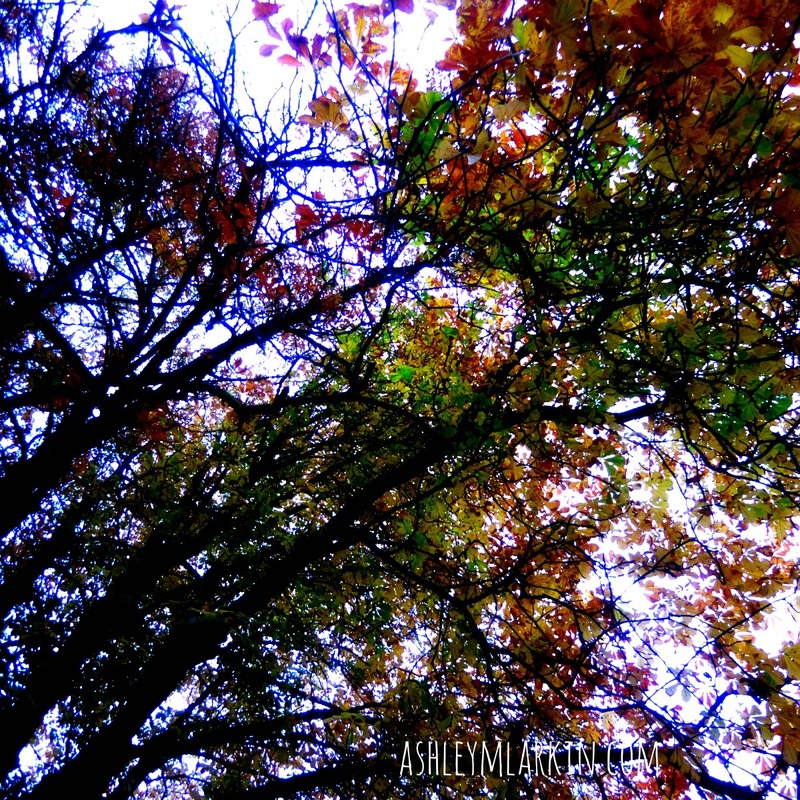 I just love your words, sweet Ashley… how they flow and feed and nurture! Karrilee, you never fail to encourage. Thank you for that gift of your presence. I had to smile when I read your words about changing your wardrobes for the winter season. I couldn’t help but think that we are not much different than the trees, for we also change our summer fluff for a winter coat of heaviness to keep the cold at bay! This is so beautifully written, my friend. A delightful read. Mia, I smiled when I read your comment — that’s exactly what I was thinking as I wrote about our changes of clothes. I’d never thought of it quite like that before. That’s one benefit of just writing it out on Five Minute Friday, isn’t it? As always, grateful you’re here, friend, and praying for your health. Such beautiful writing Ashley, & such a blessing to have you & your “gift” of writing in my life! Grateful for you, my friend. Thank you for your loving words. This was beautiful! So glad to see you on FMF. Yay, Amber. It’s been a while since we connected — happy to see you. Heading over to read your FMF post, too. I Dearly Love Trees! You Savored your Tree so beautifully! I love my tree outside too! The Yellow Banana Tree because of it’s yellow leaves. They are nearly half gone from just today’s wind! Trees are special! I love your Tree Honoring today. I am grateful that you, too, know what it is to love trees. Nearly every time I am among trees, I come away feeling more peaceful, more grateful, more held. What a gift among creation. And The Yellow Banana Tree — how fabulous. Enjoy your bark-covered friends today, dear Kelly. I could read your words all day, I didn’t want the story to end. Beautiful! You have an amazing gift. So thankful our paths crossed. So thankful, too, Jennifer to be getting to know you and your beautiful heart. I love tree stories. My favorite writers always pay attention to trees. We too have a horse chestnut tree in the yard. There’s no barefoot running under that one! I love tree stories, too, Christie! Why am I not surprised we have that in common? :-) Yes, I think we’ve all made the mistake of walking under that tree barefoot. It only takes once. Loved this story. Your girls tried to sell poisonous chestnuts! That is epic! I am glad you were able to avoid death and lawsuits. My girls are forever trying to sell things too. Crying out their wares like the newspaper boys of old. There is nothing quite like a big old tree to anchor the memories of happy childhood. I love that, Leah: “Crying out their wares like the newspaper boys of old.” My girls, too. I’m always a little worried they’ll feel defeated when their items are left untouched (or purchased by only a few loyal friends and neighbors), but I do believe it builds character, and man, they love it. And I totally agree about the tree as anchor of memories. How beautifully put.